I used to be organized. I really was. Every Saturday morning I would sit cross-legged on the sofa, coffee on the side table, cookbooks piled beside me, scrap paper on my lap and pen in hand. From this happy perch I would flip through my cookbooks, while writing, scratching out, tweaking and, ultimately, jotting down exactly what meals I would cook the next week and precisely which ingredients I required. Mark and I would then collect our shopping bags and head off for Brisbane’s Green Flea Market. Sure, I occasionally varied from my set schedule. Spontaneously inviting friends over might require a quick ingredient top-up at the Vietnamese grocery downstairs. Or, while trudging between the ferry stop and our flat after a late day at school, the oompah music and sidewalk-table conviviality of Lefkas Greek Taverna (and the adjacent bottle shop) might draw me in. Passing that siren call, the cocoanut-curry smells of Thai Dream would sometimes entice me to walk just a few steps past my stairs for takeaway. And, even if I made it safely to the apartment, laziness could always trump my menu plan and encourage me to boil the spinach and cheese ravioli made across town by Italians and sold at the Greek store down the street, which was always fabulous with an easily-concocted sauce of good-quality tomato paste, toasted pinenuts, parsley, basil, parmesan, and olive oil. But, usually, I stuck to my plan. Ah, those were the days. Now, I live in Zimbabwe and my shopping and my cooking have no rhyme, reason or semblance of organization. When we first arrived, I tried, fruitlessly, to make a comprehensive weekly shopping list. Inevitably, I would tear it up in frustration after our trip to a third grocery store. Overall, I must say, the grocery stores here have many, many items. But, they have no specialty ingredients (oh, how my heart pangs when I see stunning recipes that hinge on mascarpone cheese) and their stock is very unpredictable. The minute you NEED an eggplant and only an eggplant, it will be nowhere to found. Out of flour? There is sure to be a shortage. Desperate for milk? The long-life milk has disappeared from the shelves and the fresh milk is spoiled. Vital kitchen implements often meet a similar fate: I once forced my husband on a futile, city-wide search for a bundt pan. Eventually, I developed a new menu-planning scheme. I go to the stores with the best fruit and veg, buy whatever looks fresh and beautiful, and figure out what to do with my cornucopia when I get home. The result? I love recipes that can adapt to the whims of my fridge’s most recent arrivals. 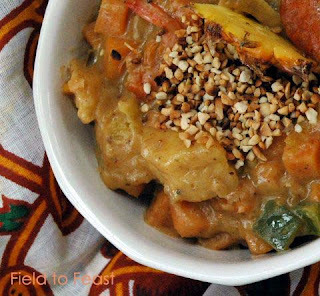 And, so, I love African Peanut Stew. You could probably throw any vegetable in here and it would taste just fine. Eggplant, corn, green beans, squash, peas, tomatoes – bring it on. Even tofu would be a welcome addition. I made this recipe last night with what I had in my fridge. This included some dried shrimp that a friend brought us back all the way from Brazil. (Shhh, don’t let Customs know.) Yum. I highly recommend the pineapple if you have it, the chilies add a vital bite, and, of course, the peanut butter is a must-have. Otherwise, may your crisper dictate your dinner. Heat the oil in a large saucepan over medium heat. Add the onion, leek, garlic and ginger and cook for five minutes. Stir in the ground cumin and ground coriander and cook for one minute. Add the sweet potatoes, carrot and chilies and cook, stirring occasionally, for another 5 minutes. Add the salt, vegetable broth, pineapple, green pepper and optional dried shrimp. Bring the stew to a boil, then cover and reduce to a simmer. Cook for 8-10 minutes, or until the sweet potato and carrot are soft. Mix in the peanut butter and cook for a final five minutes. If you want a thinner or thicker stew, you can add more peanut butter or, alternatively, more broth. Serve the stew hot, with the toasted peanuts either sprinkled on top or stirred through. Fresh coriander/cilantro also makes an excellent garnish, if you have it. 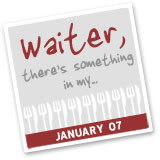 This post in an entry in the inaugural Waiter, There’s Something in My…, a monthly food blog event organized by Cook Sister!, Passionate Cook and Spittoon Extra. Janaury's theme is stews. I love this posting, as i remember the weekends that Rita and i spent driving around Harare looking for that one all important ingredient, at the same time calculating how much fuel we were using looking for the yogurt i like and some fresh ginger. Hope you are doing well, i think of you often. Pass my regards to Mark! Tracy! I totally should have mentioned that in the post - calculating in your head the ratio of fuel used to the level of your desperation for a particular item. We miss you!